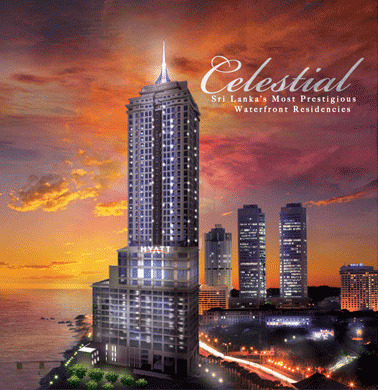 08/07/2012: Hyatt Regency hotel coming to Celestial Tower after ownership handed over to new company. Construction to resume soon. "Celestial Residencies, is to be sold soon at a price of USD 75 million (approximately Rs.8.2 billion) or above in a bid to make repayment for disgruntled depositors of failed Ceylinco Shriram group which has invested around Rs. 1 billion for the 45 storied building project. The Committee of Chartered Accountants headed by Prof. Lakshman R. Watawala, under a directive of the Supreme Court, publishing news paper advertisements has called for investors to invest in Celestial Residencies."